The hunt for justice is timeless… A body found buried outside of Reno, and now another woman is missing… A tragic event had led to Micah Stratford to leave the Chicago Police Force and head for his family home and museum in Reno. He has come looking for a chance to see what he really wants for his life, but his skills are quickly called upon when a woman goes missing from a local casino. Sienna Johnston has come to Reno for a book conference and to interview several well-known authors for videos she’s making for a restaurant she’s opening in New Orleans. It’s also supposed to be a fun girls weekend with a friend, but when a mysterious person of interest in a local crime seems to only be seen by Sienna, her plans are changed. Micah and Sienna are thrust together as he offers to protect her during the investigation. But will he believe her when she tells him her theory on why no one else has seen her ghostly cowboy? Enjoyed the story, characters were well developed and in the style of the author, the “bad guy”…is right in front of you the entire time. My biggest negatives would be…the editing/proofreading was absolutely awful…the editor needs to kick the person responsible to the curb. And secondly…the book was only 94 pages and cost the same as her full length books…what’s up with that..it’s partially my fault for not checking (but since I didn’t realize I needed to check the book length…I can’t take all the “blame”). Will definitely be sure it doesn’t happen again. A perfect blend of past and present. The characters are very relatable. Wonderful storyline. Vivid details draw you into the storyline. 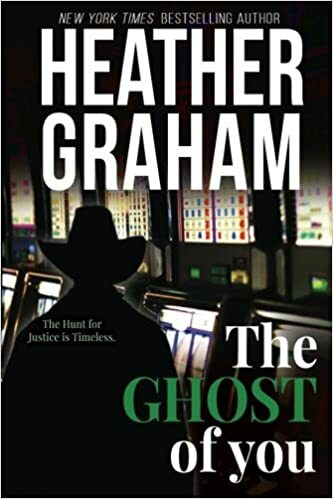 Heather Graham‘s books always leaves me wishing they never end. I wish she can write quicker to have one released daily. You will not be disappointed by this story. Keel them coming!